My name is Danielle. Even with two adults working full time in our house, we still have trouble buying groceries after our bills are paid. Sometimes I feel like I can’t buy the healthy food that I want to get, especially for our three-year-old son. Our lease is up for renewal soon and I am really concerned about our rent. A big portion of our budget goes to rent already and I worry what it will be increased to this year. this program really helps make ends meet. I am really excited about the fish and the fresh fruits & veggies from Mobile Harvest. 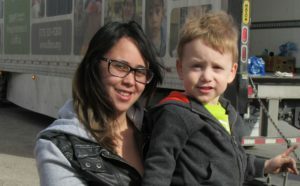 Danielle is thankful for the help she receives from the Food Bank for her family.